A root canal is a dental procedure conducted when a patient’s tooth has become damaged due to injury, infection, or decay. Typically, the enamel and dentin of the tooth have been tampered with by bacteria, which has infected the soft tissue within the tooth, called the pulp. During the root canal procedure, a dentist creates a hole in the side of the biting area of the tooth. The tooth is then disinfected using either fine tools or medication. The hole is then filled with a sterile material and the tooth is crowned. Many dentistry patients don’t look forward to a root canal procedure. However, these procedures can help to keep patients from needing a dental bridge or a dental implant in the future due to a loss of the tooth. Up to 47.2% of American adults who are over the age of 30 have at least some type of periodontal disease, which can increase the risk of needing a root canal procedure. Fortunately, there are ways you can help prevent yourself from needing this kind of treatment in the first place with proper dental care. See your dentist regularly. Many Americans only see their dentist once every three years or only when they feel dental discomfort. Seeing your dentist twice a year for checkups will help keep your smile intact. Brush your teeth after most meals or at least twice a day. If you’re away from home, rinse your mouth out after you’ve eaten. Floss your teeth to keep your gums healthy and to get rid of any pesky food that may cause bacteria to spread. Avoid eating too many sugary snacks or brush your teeth immediately after consuming them. Bacteria on the surface of teeth feed on sugar. Take your dentist’s recommendations to heart. Your dentist is a medical professional and knows what to do to keep your smile healthy. 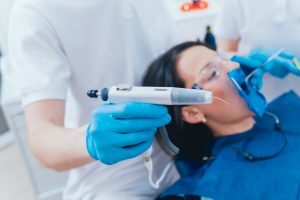 Root canal procedures are no one’s cup of tea, but they’re sometimes necessary in order to avoid further infection that may result in a loss of your tooth. By following these dental care tips, you can help prevent the need for this type of procedure from being necessary.